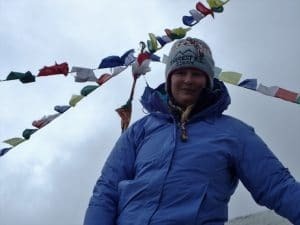 My journey Reaching Everest Base Camp against all odds. Do you ever dream of doing something you feel would be incredibly intangible for you to do? I know I do All the time!! 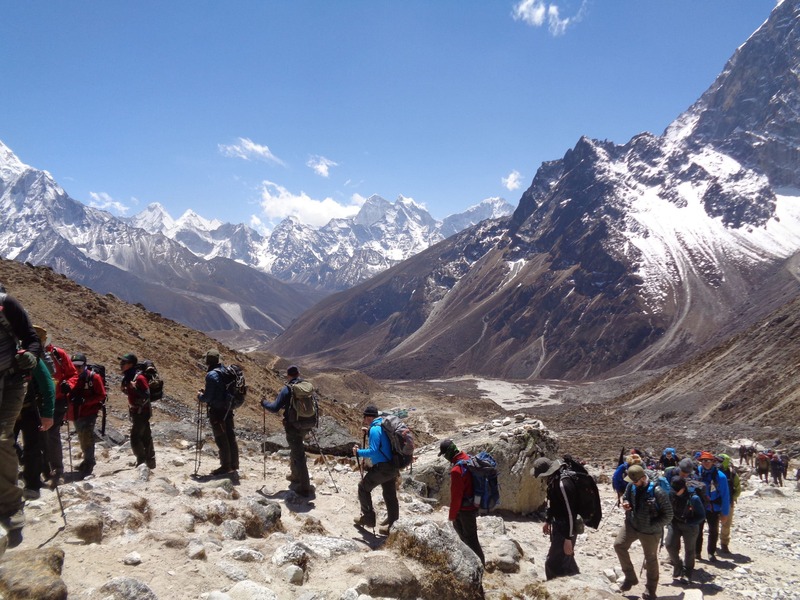 Mount Everest Base camp is one of many of those dreams! But what if I told you that making your dreams come true is all inside of you? This is happening for me! And it’s all because I started to have faith in myself that I could achieve the impossible! In October of 2009 I traveled to Arizona. I wasn’t there for a vacation. I was there to find out why I had been wheelchair bound for the last year unable to walk more than a few steps without being in excruciating pain! Why my leg muscles would cramp up into balls uncontrollably! I had an apt with the world renowned Mayo clinic in Arizona for a month log stay. Which meant I had to leave my husband and 3 children at home and go live in a strange place by myself for a whole month in a wheel chair unable to walk. It was one of the scariest journeys of my life. Not just to be in a strange place by myself but to find out if I was ever going to walk again! Luckily this wonderful family I found through my church leaders took me in for a month and helped me more than they will ever know. After seeing countless Doctors and going to countless appointments for a month I was diagnosed with Chronic Fibromyalgia and Hashimoto’s Autoimmune disease. My bodies immune system was attacking itself which was causing me to have numerous infections and my muscles to involuntarily cramp up on a continual basis. I was in constant pain and agony! The Doctors told me that I would probably be in a wheel chair for the rest of my life and would never be able to walk normal again. After learning this I was feeling like there was no use of going on. That I could never be the mother that my children needed me to be or the wife my husband would want. I felt completely alone and helpless! My Husband was finally able to join me in Arizona I had to have my 11th bladder surgery performed by the Doctors there at the Mayo Clinic. He was able to get a week and half off of work. So then underwent extensive surgery on my bladder. Where they took skin out of the inside of my thigh and made a sling out of the tissue to connect to my pelvis. This tissue was to hold up my completely collapsed bladder. After undergoing this surgery and recovering in the hospital for a week my husband Brandon drove us home. I could not fly home because of the complications from the surgery. It was the most painful road trip I had obviously ever experienced and the most stressful one for my husband. He had to drive with me laying in the back seat for 15 hrs on pain pills and in agonizing pain! I think it’s something the both of us would never forget. My husband attended to my every need. He helped me out of the car numerous times to the rest room and to feed me and make sure that I had all my medication on a regular basis when needed. He loved me and took care of me the way nobody in my life ever had! I know that when you get married it’s for better or for worse and for sickness and in health but at this point I guess I was going where is the Health going to come play a role in our lives! I’d spent so much time sick and hurting and in surgeries and depression I thought now we’ll never get a break! This was it! This was going to be our lives forever! I spent so much time in that frame of mind it consumed me to the point of losing myself to being the eternal victim! Then of course it didn’t just effect me it effected my family! I saw no way out except to die! But that is a whole other story for another time (Later to come in my book that I am writing). Let’s fast forward to December morning 4:30 am 2015 my husband Brandon comes home from work and I’m just leaving for work. He says to me remember when we were watching the movie recently called Everest? 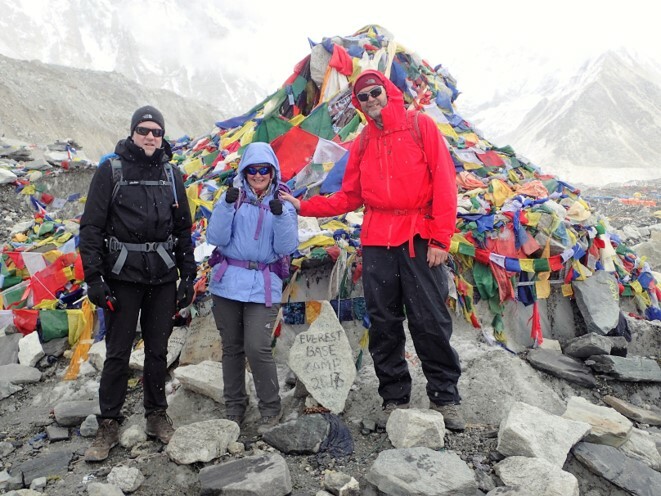 I said yes he say’s well I found out that you can go to Everest base camp and sleep there but not summit! The Himalayan mountains have always intrigued me but I never thought it would ever be something tangible! So he proceeded to tell me about Ian Taylor Trekking company that he found on You Tube. I told him that I would research it and let him know what I thought. I went to work and it was on my mind all day. 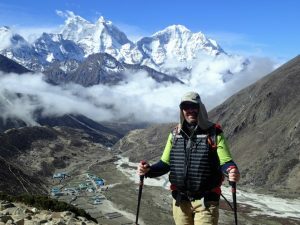 Finally on my lunch hour I was able to watch some You Tube video’s for Ian Taylor Trekking and I was immediately intrigued! I guess my biggest question was all of these people that are trekking to base camp how do they train for something like that? And for me the biggest question is this something that my body can actually handle?? My mind began to race with questions. So when I got off work that day I called Brandon and said I want to know more about this and how it works. He told me to make a list of questions and we can call Ian Taylor and ask him. Brandon called Ian and set up a time for that weekend for us to talk with him. We did a phone meeting with Ian and he was very easy to talk to and he answered all my questions. I told him I had some physical limitations but I have been working on strength training. He said that’s fine take some time and see what you can handle. He said that if you can handle a 5 mile hike in the Wasatch mountains here in Utah and carry a backpack on my back weighing at least 20 lbs. you can do this. I wasn’t sure how I was going to achieve this but I was determined to try! So that weekend we decided to go get snow shoes and try snow shoeing since we can’t hike in the winter. I wasn’t sure how this was going to work but we were going to get there together. One thing about me is when I make up my mind to do something I usually get it done one way or another. So I went to the gym during the week and continued my cardio and weight training. Then every weekend we were up in the mountains snow shoeing! It was very hard at first. I really could only make it about a mile and a half. I have high altitude asthma and so I was having a hard time breathing. So we called Ian and he talked with us about how to breath correctly. He talked with me about getting an inhaler to assist me in breathing. He had some very good coaching idea’s. That helped so much. I went to my Dr and got an inhaler and that helped a lot. I just appreciated the fact that I had someone to coach us along on this journey. Finally that March I mailed our down payment for our Mount Everest Base camp trek! It was set in stone now we were going to go to the Himalayas!! Over the course of the next year I was able to email Laura Gravino with Ian Taylor trekking with any questions at any time. She was always quick to responding to me and had such helpful answers. She was there every step of the way. It was so nice to have such a great support system all the way up to the trek! I really started to believe that I was going to be able to achieve this. I had so many people telling me that I was crazy and that I couldn’t do this! And what was I thinking! But I knew deep down inside that if I had the determination to trek to Mt. 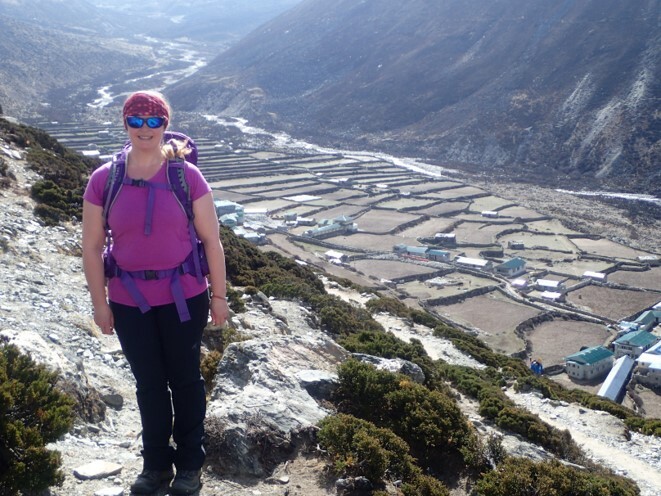 Everest Base camp and if I achieved this that I could accomplish anything in my life. I had already had accomplished so much in my life that I knew I could do this! I also knew that with the love and support of Brandon together we could conquer this. He really kept me going! There were times I just wanted to give up but he helped me keep my eye on the prize! We got our kid’s out snow shoeing and hiking with us too. I believe it brought our family together! It brought Brandon and I together as well to have a goal that we were achieving together! What better place to build a relationship with your kid’s and your spouse than the mountains. I became my relief on the weekends to go to the mountains and just be in God’s Nature! I felt whole for the first time in my life. I felt like I had a purpose and a strength I had never had before! 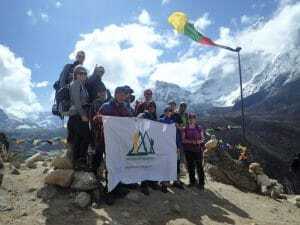 Finally after all the training and the preparation physically and mentally and financially the day came to travel to Nepal. I can tell you I was nervous, scared and excited all at the same time! We had a 40 hr travel time ahead of us. We gave all of our travel information to Laura so she had our Itinerary and knew when to have someone to pick us up in Kathmandu and take us to the hotel. She had a copy of our Travelers insurance policy just in case we had to get a helicopter out for any reason. We had a video to watch on You tube on how to pack and everything we needed to purchase for the trek and how to pack it! This was such a big help and it was so informative! We met up with the group that night we got there at the hotel. 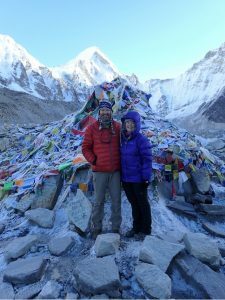 We had dinner with Dawa Sherpa and his wife Kay to get us introduced to our hiking team that flew in from all over the world along with our lead guide Pasang. It was so cool to meet all these people that we were going to be spending the next 16 days with. They were all so informative and knowledgeable! It made my husband and I even more excited for our adventure to start the next morning! So with jet lag and no sleep for 2 days we went to bed and slept for about 4 hours our time clocks were all messed up! But with adrenaline pumping we were ready to go! We met up with our guides and our group at 5 am and we were off to the airport to fly to Lukla! There was so much excitement from the whole team! We were all pumped and ready to start our adventures. It was an adventure of a life time and it was just sinking in that it was real! I was really going to hike in the Himalayas! Of course I had some trepidation that I wasn’t going to be able to make it to base camp but I was going to do my darndest to get it done! The villages were amazing the people were amazing the scenery was AMAZING! I have to say our team was AMAZING too! We all supported each other every day and were there for constant encouragement when needed. It was like we were all friends before this trek. It was so cool how you can take a group of people from so many different walks of life and put them together and create this unstoppable team. 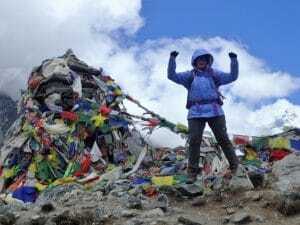 There were days that we all had our struggles and with Pasang as the ultimate guide and his porters Chungba, Nima and Sonam at our side the whole time it made this trek absolutely perfect! Pasang checked our heart rate and oxygen every morning and night. He made sure we had food when we needed it and Ginger lemon Honey tea (GLH) 3 or 4 times a day. If we were nauseated he was there with a cure. If we were dehydrated he was there with a cure. He took very good care of all of us. On the trek there were a quite a few days that I was sick. I couldn’t keep nothing down. Pasang stayed with me and encouraged me and help me reach base camp. He would stick by my side when all I could do was put one foot in front of the other very slowly. And when I would reach the top of the hill the team was always there to cheer me on! I didn’t tell the team that I had had physical ailments until the night before we went back to Kathmandu. 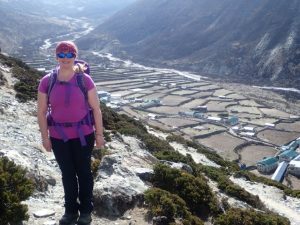 I decided that I was going to do this trek and I was going to be strong like everyone else and not have that hanging over my head. 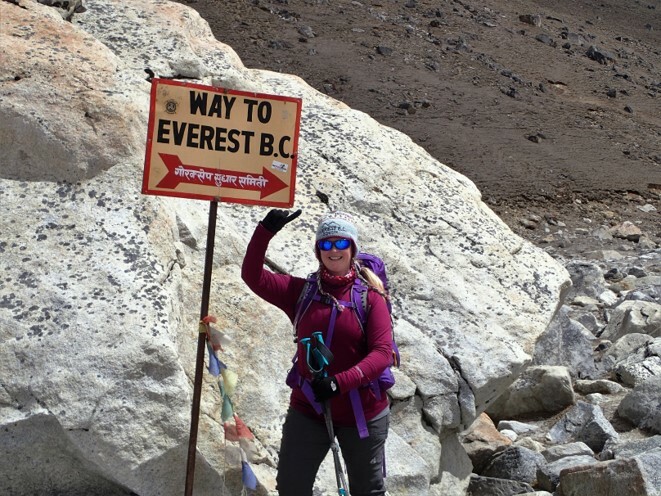 I knew that if I just kept pushing on I would make it to base camp! I knew I had it inside of me just like when I knew I would beat my life long depression and physical challenges and getting out of a wheel chair! I had the power within me to achieve what I desired! So despite all of this I made it to base camp! And when I stepped onto base camp and stood next to the monument there and looked around and looked into my husbands eyes and said we made it Honey I wept! 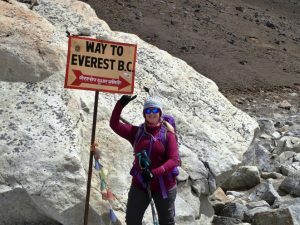 I couldn’t believe that I Jen Smith had made it to base camp. To this day it still brings tears to my eyes to say it!! When we got there we all rejoiced even though it was labored to breath. 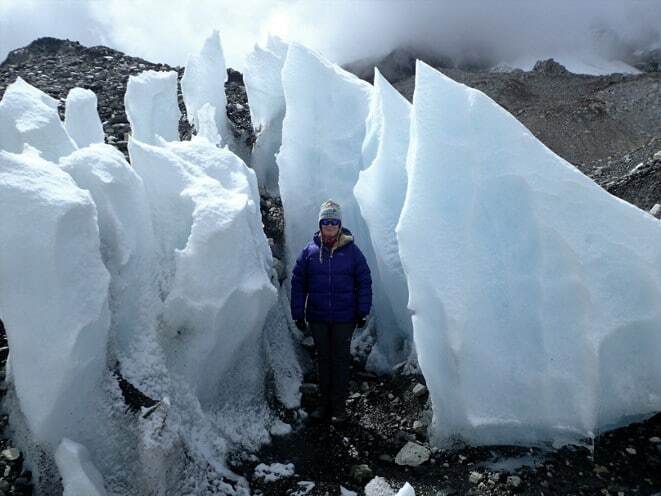 Then to be able to walk around base camp and see where these people are living for months to prepare to summit the highest peak in the world was amazing! 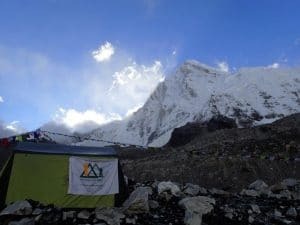 It was an overwhelming experience to be able to sleep at base camp. All of the other trekkers that hiked there that day had to turn around and go back down to Gorak Shep. But not us, we got to sleep there in a tent on the glacier surrounded by the tallest mountains in the world!! We got to stay here over night because we went with Ian Taylor trekking. 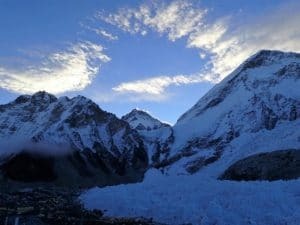 Then to be able to wake up at 4 am in the morning to the sun rising over Mt Everest and all the peaks surrounding you 360 degrees was the most breath taking moment next to giving birth to my 2 children! I honestly can’t even think of words to describe it you just need to go there and see for yourself to understand it. I messaged my children from base camp with tears streaming down my face just so that they could see the beauty! Of course they didn’t get the messages from me for days later but I just wanted them to feel what I was feeling in some way. Then to be able to share that with my husband made it the best thing ever! I know that with the love and support of my wonderful Husband, Children, family and friends anything is possible! I can achieve anything I put my mind to. I feel so loved and Blessed by God to be able to walk in these beautiful mountains he created. To be able to meet the beautiful Nepalese people and see their culture and realize how blessed I am to be able to walk where great people of history have walked! I am so grateful to Ian Taylor for making this trek possible for my husband Brandon and I. I know that the growth that I’ve had with this experience has been life changing for me. If this is something you don’t think you can achieve think again because I was in your shoe’s and I did it!!!! I am in the process of writing a book about my life and how I took my power back and made my mind up that I was going to live life and not let life live me! So find out more about my story in the book to come. Until then Happy trekking to Everyone! Namaste by Jennifer Smith In Riverton, Utah, USA.